Industrial stars Chris Connelly and Bill Rieflin have teamed up several times before to create some of the most intense, brutal, shattering songs you've ever heard. 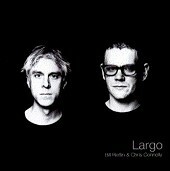 However, on Largo the songs hit you with a quiet intensity, relying mainly on the piano for support. Bill Rieflin plays piano, keyboard assortments, and does backing vocals, while Chris Connelly sings and plays guitar. This isn't what I expected when I put in the album. I expected driving, rhythmic, pulsating industrial tunes that shower out of the speakers at the speed of light. Though, this was quiet a delight. In the same way their industrial songs over power me, this collection of loungy-jazzy-pop songs break down any preconceived notions or barriers and moves directly to your soul. The songs are warm, passionate, and tender, with equal parts sorrow, emotion, and an uncompromising attitude shining in every song. Quite the collection, in deed, Rieflin and Connelly break through their own tags and create a sound that, I'm sure, will floor fans several times over. Non-fans will even listen and become fans. You can't ask for more than that. I'll give it an A.